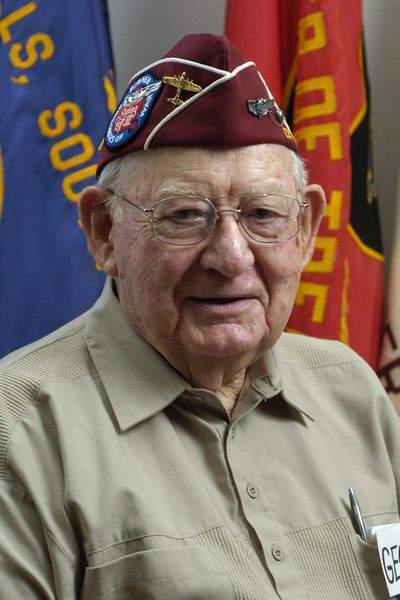 "I enlisted in the Army Air Force as an aviation cadet in April of 1942, received my pilots rating in April of 1943. I was sent to Pyote, Texas, as a co-pilot on a B-17 and finished training at Dyersburg, Tennessee. I was sent back to Pyote, Texas, as a 1st pilot and got my own crew. Finished training at Dalhart, Texas, and prepared to go overseas. We went to Grand Island, Nebraska, to leave for England. We were split into 2 crews of 5 each and had ATC crews fly us to England in 2 new B-17s. When we arrived in England we were sent to the 338th Sq. of the 96th Bomb GP. 45th Combat Wing of the Eighth Air Force, located at Snetterton Heath, England. We had a crew of ten: pilot, co-pilot, bombardier, navigator, radio operator, engineer, tail gunner, two waist gunners and ball turret gunner. Among them were First Lieutenant John E. Bedell, Lieutenant Baumgartel and Sergeants Reagin, Montgomery, McMonigle, Goettling, and Pearce, and Abner Fisch. On Jan. 24, 1944 we started flying combat missions, When we arrived in England 25 missions was a tour of duty but because of the heavy losses they raised our tour to 30 missions. On our 18th mission we were hit with flak and the radio operator injured and one of the Lts was injured seriously. On our 27th mission April 27th we were hit with flak and had to jettison our bombs in the Channel. May the 8th we left on our 29th mission and were leading the low squadron. The Group was lead by 2 pathfinder planes (these were equipped with radar) one of them aborted at the Channel, so we only had one left with radar, we were headed for Berlin. As the German fighters came up they took out the lead ship we had left. So we had no radar and it was a heavy overcast day. By this time we had lost about 8 planes. As I was leading the low Sq. I asked the rest of the group to form on me and we would bomb on the B-24 smoke bombs. I think they were headed for Frankfurt. As we turned to go over the target we were hit with flak and couldn't get bomb bay open to drop our bombs. As we headed back to England I only had 2 planes with me so I radioed to a group ahead of us to slow up so we could catch them. Their answer was we can't, you try to catch up with us. At that time 2 ME 109 fighters made a head on attack and one hit us between No. 3 and 4 engines snapping of the wing and sent us into a spin. I ordered the crew to bale out. My co-pilot could not get his chute as it was behind his seat. It was the type you wear the harness and attach the chute with 2 large snaps. I was wearing a back pack because I was short and it gave me better rudder control, the plane exploded and I was blown clear, but as I was about to pass out I pulled my chute as soon as I could. Saw a couple of empty chutes and then passed out completely. When I hit the ground I was met by several farmers with pitch forks and I was thinking this was all there was going to be. Two soldiers came to my rescue and told the farmers they would take me in. I was taken to Dulag Luft for interrogation. The tail gunner and I were the only ones to survive, the other 8 were killed. I went down near Hildesheim. As I had a broken ankle and many cuts and bruises I was taken to the hospital at Obermasfeld. On June 6, 1944 I was taken by train to Stalag Luft 3 at Sagan. After a couple months I was able to get around without my crutches. We were 15 to a room and the bunks were 3 high so we were very close to each other, and short of food and heat. As the winter was getting colder the Russians were advancing from the East and getting close to camp so we were told to be ready to vacate camp at an hours notice. On January the 28th, 1945 at 12:30 AM we left camp by foot in snow and cold. We walked 17 kilometers to Halbau and 11 more to Freiwaldau. We then walked to Muskau by mid afternoon of Jan 29th. We left Muskau Jan. 31 at 1 PM to go to Graustein. Feb. 1 we went to Spremberg. Friday Feb. 2 ended our March of 62 miles. We were put in 40 & 8 boxcars and arrived at Nuernberg's Stalag 13 D on Feb. 4. The conditions were worse then at Stalag Luft 3. As the Americans got closer from the west we were again told on April 3 to be ready to march. April 4 we again hit the road but weather was much better then it was in Jan.
After 9 days and 91 miles we reached Stalag 7 A at Moosburg. This was the worst of the camps as it was so over crowded. I was put in a tent and on April 29, 1945 we heard a lot of gun fire and knew it was very close. The 14th armored Div. liberated us and it was great to see the American Flag flying. I wouldn't want to go through this again, but it has made me appreciate a lot of things that many take for granted. My German POW No. was 5497." Last update 23-9-2008 by © Team Moosburg Online (E-Mail) - All rights reserved!